CRM Online 2015 Update 1: official pre-release content is here! 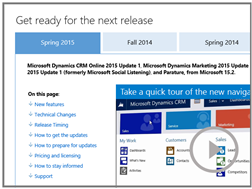 The pre-release documentation is now available for Microsoft Dynamics CRM Online 2015 Update 1. More content is being prepared for launch, and we’ll be sure to notify you as it’s ready. Meanwhile, here are the resources available now. Links in the footer get you to similar content sites for Social Engagement, Marketing, & Parature. What’s new in Unified Service Desk for administrators …And much more! What’s new in Unified Service Desk for developers …And much more! 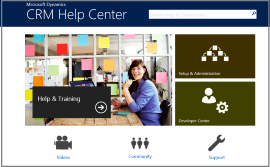 The CRM Help & Training site (formerly named the CRM Customer Center) has user guides, videos, e-books, and how-to topics for CRM versions from 2013 on up. You’re encouraged to use the content to create your own training and adoption materials –check out the editable Word docs and templates in the training and adoption kit. User guide: CRM Basics for sales pros and service reps …And much more!